With FESPA celebrating its 50th anniversary this year Vink/Amari decided to mark the occasion in some style by hosting an evening of entertainment at the prestigious Institute of Directors (IoD) in London’s Pall Mall. The company’s Managing Director, David Williams, who is himself a member of the IoD, welcomed more than 150 guests, who enjoyed two highly stimulating, but very different presentations. Firstly, Professor Eddie Obeng, a business entrepreneur and expert in the field of project management captured the attention of the audience with amusing, yet sound advice on how to ‘future-proof’ a business. This was immediately followed by a ‘hands on’ wine tasting and appreciation demonstration by Tim Syrad from the Association of Wine Demonstrators. A sumptuous dinner was then served in the beautiful setting of the Nash Room, which was originally the library of the United Services Club, and is now adorned with oil paintings of royal figures ranging from Charles I through to the present. 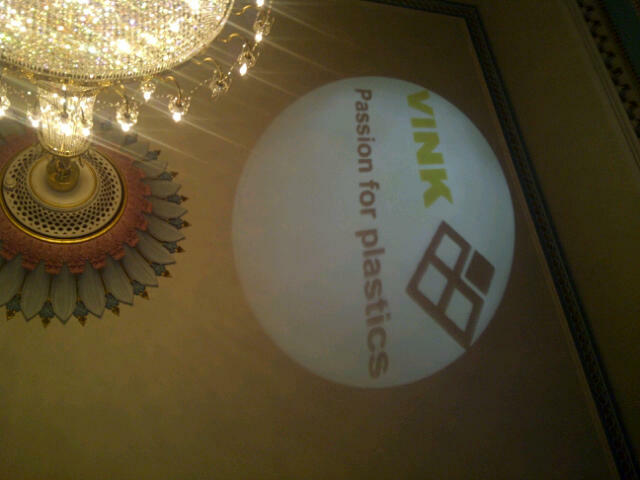 These august surroundings were complemented by a modern touch, in the form of LED light projectors, which were specially designed for the event by Vink Lighting UK and were used to emblazon group company logos onto the decorative ceiling, thus highlighting the diverse range of products and services available through the Vink/amari group both in the UK and across Europe. Great thought was given to table placements and seating plans in order to ensure that businesses with mutual interests could be positioned together to facilitate maximum opportunity for constructive ‘networking’ and, in order to further reinforce the message, a copy of Vink Lighting’s ‘LED Bible’ was left on the table for each guest, along with a branded memory stick containing details of Vink’s latest range of Digital Signage products. After the meal, everyone, including the people who put so much time and effort into making sure everything ran smoothly and efficiently, had an opportunity to relax, socialise in a comfortable atmosphere, with the representatives of leading high street retail chains taking the opportunity to chat to signmakers, who in turn welcomed the chance to buttonhole product manufacturers! Thus for or a few busy hours, the whole supply chain was able to debate the merits of various innovative suggestions and solutions, while being deftly guided and controlled by the organisers. All in all, the event succeeded in its main aim of enabling the group to sreveal the full scale of its operations, with both the European and UK core and specialist businesses leaving their guests with the lasting impression that Vink/Amari are a significant organisation, as well as a force to be reckoned with.